Friday February 8th 1878. I arrived in Peoria at six oclock this morning where I waited till nearly eight. I got me a cup of coffee here. Tom was at the depot when I got to Delavan. We went over to the other depot and met George. The folks were greatly surprised to see me. The funeral was at the church at two oclock it was a most affecting time. I could hardly realize that Etta with whom I had passed so many pleasant hours was being put away in the cold ground. The weather was most disagreeable. I helped Aunty get the supper after we got back. Lorna came home tonight. 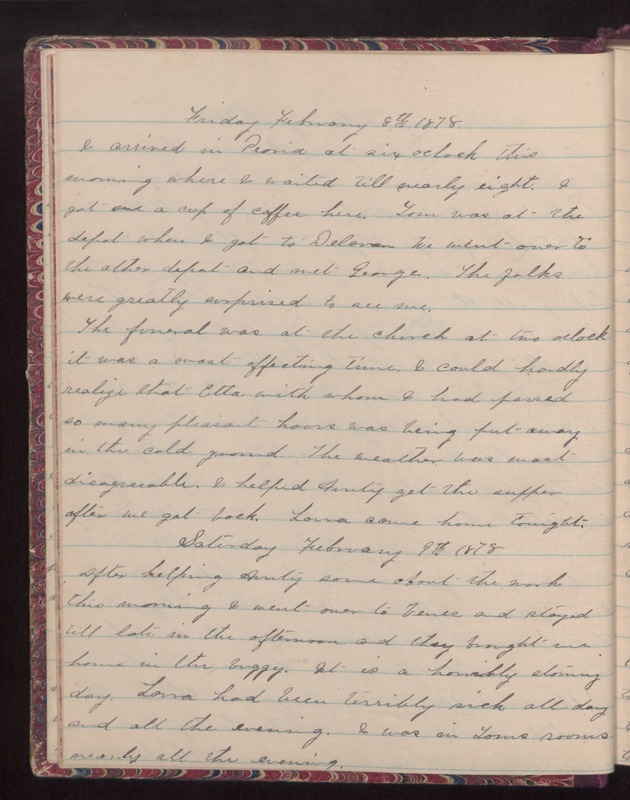 Saturday February 9th, 1878 After helping Aunty some about the work this morning I went over to Venes and stayed till late in the afternoon and they brought me home in the buggy. It is a horribly stormy day. Lorna had been terribly sick all day and all the evening. I was in Tom's rooms nearly all the evening.